Air travelers have faced heightened security measures since last month's attempt to bomb a U.S.-bound airliner. Slovakian police chief: Incident was "a silly and unprofessional mistake"
(CNN) -- An aviation expert says an incident in which an explosive material was placed in an unsuspecting passenger's luggage as part of a botched sniffer dog drill highlights the need for greater international cooperation to improve security at airports. The head of Slovakia's border police apologized Wednesday after 90 grams (3 ounces) of plastic explosive was attached to a bag belonging to a Slovakian man flying from Poprad, Slovakia, to Dublin, Ireland, on Saturday. The "standard sniffer dog training" was carried out amid heightened concerns over air security since a failed attempt to blow up a Detroit-bound airliner on December 25. But the material went undetected until Slovakian authorities alerted Irish counterparts, causing police and army bomb disposal experts to close off a section of central Dublin where the man lived. The 49 year old was briefly detained before being released, Irish media reported. Steve Lott of the International Air Transport Association told CNN it was necessary for airports to carry out regular security exercises to continually test the system. But he said it was unusual for genuine explosives to be used -- and for items to be placed in a passenger's luggage. In the U.S., Lott said, security drills were conducted with simulated explosives so as not to pose any risk to airport staff or passengers. 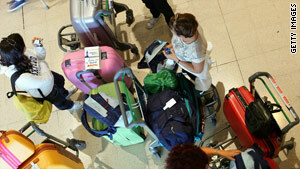 Materials would usually be placed in baggage belonging to officials or agents taking part in the exercise. "Every country does test things differently," Lott told CNN. "But we don't think the best way to test the system is to use unsuspecting passengers with potentially harmful substances." In a statement issued Wednesday, the head of Slovakia's border police called the incident "a silly and unprofessional mistake." Tibor Mako said the material was one of two samples placed in passengers' luggage. Sniffer dogs had located one sample but the police officer conducting the exercise forgot to remove the second sample after being distracted by another matter. The officer responsible would face disciplinary measures, he added. "The aim of the training was to keep sniffer dogs in shape and on alert in a real environment," Mako said. He said no one had been put in danger by the incident because the material needed to be combined with other components to be ignited. Slovakian interior minister Robert Kalinak has now banned the training exercise, Mako said. "We will search for new forms of sniffer dog trainings, so this situation will not be repeated in the future," he added. Slovakian officials claimed Wednesday that Poprad airport authorities had sent a message, via an airport-to-airport telex system, to Dublin airport while the flight was still in the air informing them of the incident. The pilot of the plane was also informed prior to take off but chose to fly because the material was not dangerous, they said. But a spokesman for Servisair, which handles Danube Wings flights arriving in Dublin, said the message was not picked up and that no one had subsequently contacted them. Irish authorities were finally informed when the police officer responsible informed his superiors on Monday, a spokesman for the Slovakian president said in a statement. Lott said the incident highlighted a worrying lack of coordination between government authorities in different countries, especially following last month's failed airliner bombing. "In this day and age when the airline industry is a global and interconnected network we need help from governments to coordinate their intelligence both to prevent attacks and to improve the system," he said. "If a test does involve international flights it should be done in a coordinated fashion with other countries and other governments." Lott said the adoption of standardized safety procedures for airlines offered an example of the way in which international security practices could be harmonized in airports around the world. "Safety is an example in which the industry has done great job. We need to use that as an example in the world of security too," he said. Bridget Fallon in Dublin, Ireland, contributed to this report.